From left: Dr. M Shivakumar, Principal, GSSSIETW, Dr. S Vagdevi, Prof & HOD, Dept of EEE, Dean Academics, GSSSIETW, Mysuru, Sri. Saravana Mani, Head open Innovation, Future Group. A Farewell Day was organized for the UG and PG students of the graduating batch 2018 in the campus at 10.00am.The event commenced by offering a floral tribute to the portrait of Hon. Founder Secretary, Late Prof. B S Pandit, GSSSIETW, Mysuru by the chief guest Sri. Saravana Mani, Head Open Innovation, Future Group, Dr. M Shivakumar, Principal and Dr. S Vagdevi, Prof & HOD, Dept of EEE, Dean Academics, GSSSIETW, Mysuru. Sri. 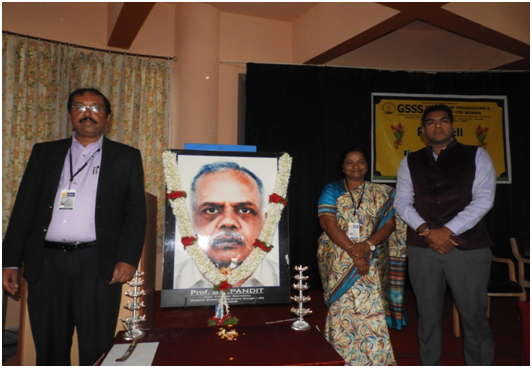 Saravani Mani addressed the students and faculty members of GSSSIETW with his energetic and motivational address. He educated the students to get acquainted with the eight forms of wealth that any individual should possess. He listed them as Physical wealth, Adventurous wealth, Spiritual wealth, Family wealth, Social wealth, Economical wealth and Career wealth. He encouraged the students to utilize the social media for professional growth rather than for entertainment. He urged the students to take a free personality test at 16personalities.com to analyze their personal and professional skills. He compared the technological growth during the past few decades and discussed about the current Industry 4.0 standard. He also advised the students to have a circle of genius / angels whom they could interact with for guidance in their career. He wished the students all success and luck for all their new ventures.